Devi Sati - Jai Maa Chintpurni Ji! Jai Maa Chhinnmastika Ji! As per the will of Lord Brahma, the Divine Goddess took human birth as daughter of a great king Daksha Prajapati and his wife Prasuti. Daksha himself was a son of Lord Brahma and Prasuti was the daughter of sage Manu. She was born youngest of the sixteen daughters and was named Gauri, because of Her fair, golden complexion. She is also known as Dakshayani, the daughter of Daksha, and Sati, the truth. 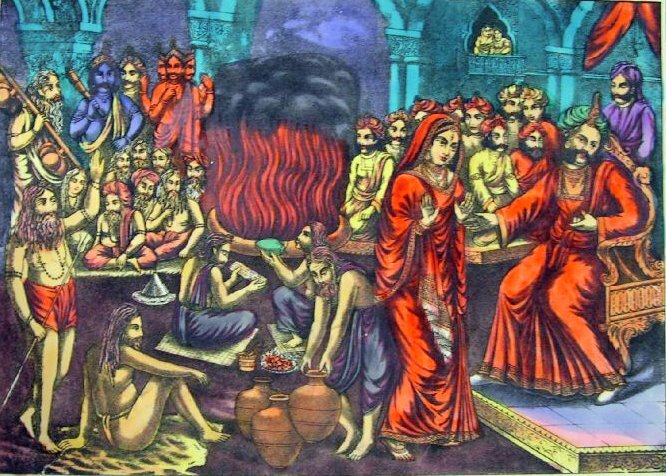 Thirteen of the Daksha’s daughters were married to Dharma and one to Lord Agni. The youngest, Gauri took human birth as per Lord Brahma's intent that She should please Lord Shiva with humble devotions and wed Him. As was destined, Gauri grew up as an ardent devotee of Lord Shiva, singing His praises and spending all Her time in His devotion. 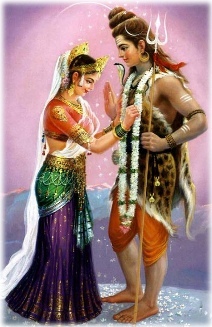 Reaching adulthood She was determined to have Lord Shiva as Her husband. Every proposal Her father brought from rich kings was rejected. She craved more and more for Lord Shiva, the God of Gods, who bestowed everything on this world and kept nothing for Himself. To win the heart of Lord Shiva, She gave up Her father's royal palace and went to a forest to devote Herself only in the worship of Shiva. She renounced food itself and started subsisting on one bilva leaf a day, and then gave up even that diet. Her prayers finally bore fruit when, Lord Shiva finally agreed to Her wishes and consented to make Her His bride. Gauri returned to Her father's home but Her father was not too happy with the arrangement. The wedding was held and Gauri moved to the Kailash, the home of Her husband, Shiva. Daksha always felt upset by the lack of civil manners of Lord Shiva. However, the Lord was highly fond of Sati Devi, He kept ignoring Daksha’s envy for Himself. King Daksha once organized a huge yagna to which all the Gods, Demi-Gods, Sages were invited. He deliberately did not invite Gauri and Shiva. She felt humiliated, however, desired to visit Her parents, relatives and childhood friends. She reasoned within Herself that She needed no invitation to visit Her own parents and decided to go anyway. Shiva discouraged Her going uninvited, but She insisted. Giving up to Her desire, He then allowed Her to proceed accompanied by His Ganas and Nandi, the bull. On reaching, Gauri’s mother and sisters welcomed Her but She was given cold reception by Her father. She wasn’t even given due attention despite the fact that She chose to attend the function against Her husband’s wishes. 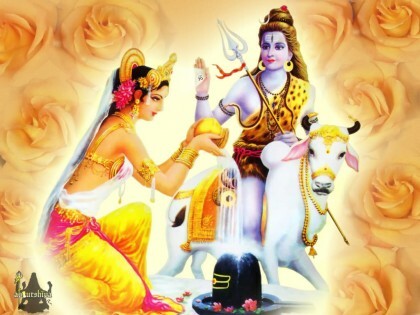 She observed that in that yagna, seats had been reserved for all the Gods, but there was none reserved for Lord Shiva. They even got involved in a heated argument where Daksha went on to disgrace Lord Shiva. Gauri sensed that Her father would never be able to appreciate who Her husband was, the Lord himself. She realised that She was the cause of this dishonour to Her husband. She was furious with rage against Her father. She called up a prayer that She may, in a future birth, be born the daughter of a father whom She could respect and who would respect Lord Shiva. Gauri invoked Her yogic powers, jumped into the fire of the yagna itself and immolated Herself. Lord Shiva sensed this misfortune and was infuriated. He created two monstrous creatures, Virabhadra and BhadraKali, out of His hair strands and ordered them to destroy the place of the incident. They created havoc at the palace of king Daksha and killed all those present there. Daksha himself was beheaded and his head burnt in the same yagna fire. Angry Lord Shiva reached the place of the yagna and picked up devi Sati’s charred body on His shoulders. He started performing the fearsome and awe-inspiring Tandava dance. His movements sent tremors to the earth’s core and caused tsunamis all over. The Gods feared a lot of destruction and called upon the Lord Vishnu to calm down Lord Shiva. Lord Vishnu used His Sudarshana Chakra to dismember Gauri's lifeless body, following which Shiva regained His equanimity. During this, Gauri's body was thus dismembered into 51 pieces which fell on earth at various places. All these places are known as Shakti Peethas and are prime centers of pilgrimage for the devotees of Maa Shakti. Mata Chintpurni Temple is one of the Shakti Peeths, where the Feet of Devi Sati fell. On realising that Gauri was not on His shoulders anymore, Lord Shiva stopped the tandava. Although in grief of losing His beloved, He calmed down and restored all those who were slain to life and granted them His blessings. Even king Daksha was restored both his life and his kingship. His decapitated head was burnt to ashes so was substituted for that of a goat. 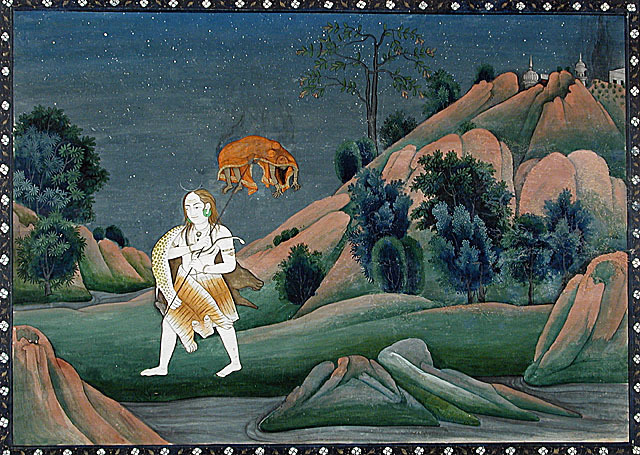 Daksha spent his remaining years as a devotee of Shiva. Sati was later reborn as Parvati, daughter of Himavan, king of the mountains, and his wife, Mena. As was Her own wish, She was born the daughter of a father whom She would respect, a man who worshipped Lord Shiva ardently. Parvati too, like Her Sati incarnation, worshipped Lord Shiva and won Him as Her husband.